Thai Peanut Chicken Tacos give leftover chicken new life with a nutty, Thai-inspired sauce and bright cabbage slaw. This is a fusion dish that will make taco night anything but ordinary. We promise you will cook extra chicken one night, just so you can make these tacos the next! This recipe was first published in full on the blog Curious Cuisiniere. We are pleased to share it with you here, with permission, for Weekday Supper. 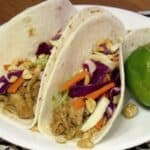 Crunchy slaw complements the tender peanut chicken seasoned with garlic and ginger in these delicious fusion tacos. Transfer the peanut mixture to a medium saucepan. Add the coconut milk to the peanut mixture and mix until smooth, heating over medium heat. Once the sauce is smooth, mix in the cooked chicken. Continue to cook until the chicken is heated through. To serve, pile the chicken and slaw on a 6” flour tortilla. Top with extra peanuts if desired. We love to travel and we love trying new cultural and regional foods. By bringing those dishes into our own kitchen we can explore new cultures every day!